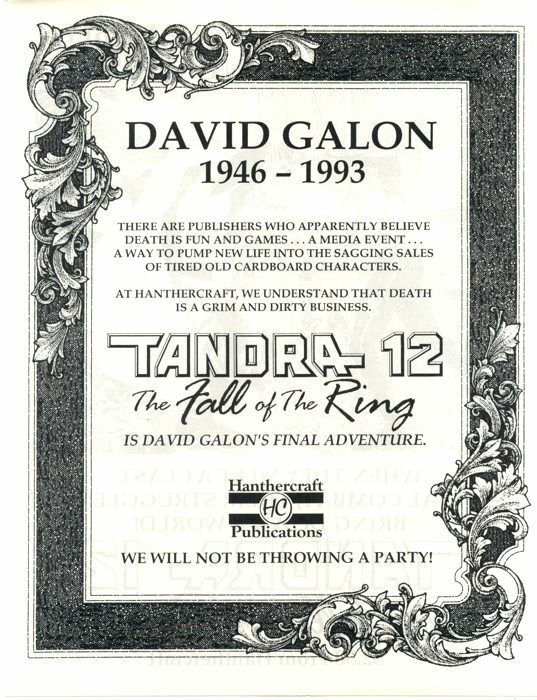 The flyer alarmed me at first…I’m not overly familiar with the title, though we did carry it at the time, so I thought at first maybe it was a memorial issue for a deceased creator. No, they’re talking about one of the characters in the book. But, if you read between the lines a bit there, and by “read between the lines” I mean “get ready for that incoming sledgehammer to the forehead,” you can probably spot the (cough) implied criticism of the Death of Superman storyline from just prior to Tandra #12’s release. That last line of “we will not be throwing a party!” is stirring up some vague memories…did DC have some kind of “Death of Superman” memorial event to advertise the storyline? Or were there such events arranged at stores across the country? At our store the only event we had was “wall-to-wall people inside, a giant line down the block outside,” so having a “party” on top of that would have seemed…impractical. But I’m reasonably sure something of the sort happened to inspire that final line in the advertisement. Well, okay, we did do one special thing at the store to commemorate the event, and that was to make a window display of comic covers from years past showing many different “deaths” of Superman. …We may have occasionally been smart-asses at times. Anyway, this I think is an interesting artifact of that period showing how at least this smaller publisher reacted to the overwhelming marketplace blitz of the Death of Superman story. That event did bring lots of customers into stores…but I bet plenty of indie publishers probably felt lost in the shuffle. So, there was at least one party. I should perhaps specify, to the extent that a 24-year-old memory can be specified, that according to the store manager the costume was a home made affair, created by its owner. In other words, the store had not hired a professional Flash imitator but had rather (probably) recruited one of its customers. So, this event was probably something initiated by the store, not an official DC promotion.